It’s time once again for America’s second favorite pastime (or first depending on who you ask): March Madness. The 80th NCAA tournament is officially underway and fans around the world are preparing for another grueling three weeks. The tournament began on March 19, with the two of the first four play in games and will conclude with the National Championship on April 8. Favorites to make the Final Four include the four one seeds (Duke, UVA, UNC and Gonzaga) and a couple of two seeds (Kentucky and Tennessee). The first-seeded UNC Tar Heels are looking to continue the momentum of the regular season in which they finished 26-5 overall and 16-2 in the ACC. The team also boasts an ACC Regular Season Championship and an undefeated road record in Conference play. After a disappointing loss to Duke in the ACC tournament semifinals, the team earned a one seed in the Midwest Region. Duke, the preseason favorite, suffered a minor setback following a shoe-related catastrophe in Cameron Indoor Stadium. Duke star Zion Williamson ripped through the sole of his shoe 33 seconds into the UNC-Duke rivalry game. Williamson was out again in following games against Syracuse, Virginia Tech, Miami and Wake Forest but returned in time to lead the team to an ACC Championship. 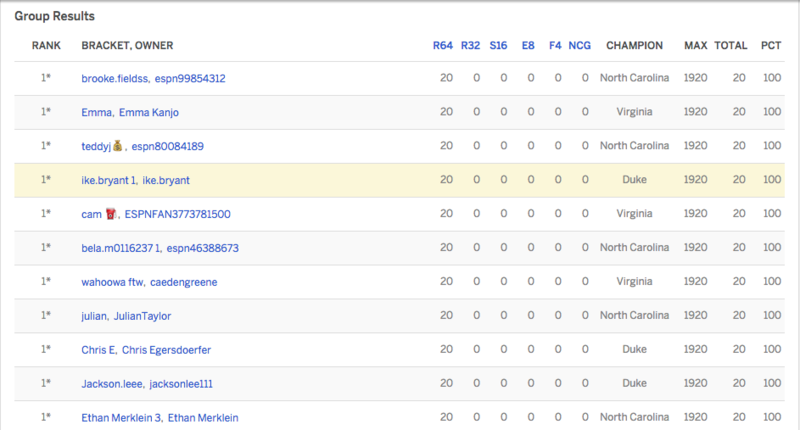 Heading into the tournament the team is the overall one seed and a top pick to win it all. The University of Virginia, the second overall pick, is looking to redeem themselves after an embarrassing loss last year to 16-seeded UMBC. This was the first time in NCAA history that a one seed has lost first round. The final one seed, Gonzaga, is also looking for redemption after losing to the Tar Heels in the 2017 National Championship. However, the team lost in their conference tournament to 11-seed St. Mary’s, once again proving that anyone can lose at any time. Here at school, over 90 students and teachers are participating in an SGA sponsored CHS tournament challenge group. Of the entries in this group, 52 have picked UNC to win it all, 16 picked Duke, seven picked UVA and four picked Kentucky. Other picks include Gonzaga, Tennessee and Purdue. Carrboro students’ picks range from carefully crafted brackets to whimsical brackets based on favorite colors, like senior Brian Kelly did. Many students fill out multiple brackets to increase their chances or simply have fun with their picks. “If I don’t know anything about the team I pick the team from the state that’s less humid,” said junior Summer Bunting. No offense to anyone here at Carrboro, but while these bracket picks could be an indicator of who looks good on paper, no one (including certified bracketologists) has any idea how this March will go. In fact, you are more likely to be killed by a falling coconut, become a billionaire, get struck by lightning, or become President of the United States (but really how hard can that last one be…) than fill out a perfect bracket.